Dear creatives, you might not remember my post from early this year about TAST or the meaning of that challenge? 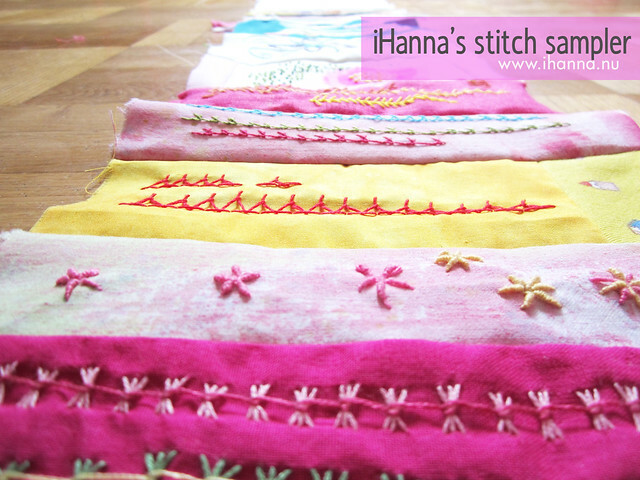 But the truth is that I’m still doing it -and I’m very proud of my determination – and my growing Stitch Sampler! I didn’t have the ambition to post my stitch trials weekly (thank god! ), but occasionally I’ve posted photos on flickr or tweeted about my stitching. Today I wanted to post a little update post about this project, called TAST. TAST is this year’s year long project where I, and many others around the world (my mom included! ), are learning a new stitch each week. The stitch’s name is posted on Pintangle every Monday evenings in Europe (that’s Tuesday mornings in Australia where Sharon of Pintangle lives). Hence TAST stands for Take a Stitch Tuesday. I’m stitching/learning the weekly stitch on a new piece of cloth each week, and when it’s finished I attach the cloth after the other pieces in a long row, using the sewing machine. The sampler is over 2 meters long right now (week 30). The edges look a little uneven (to say the least) but I have a plan on how to fix that. I will sew a lining to the back. This will cover the backside of my stitching – and make the sampler a bit sturdier. I am having fun with the stitching and encourage everyone to try a new stitch every now and then. I always say to myself how boring the example stitch look (or difficult or similar to something else or…), but once I’ve try it I really enjoy doing it! 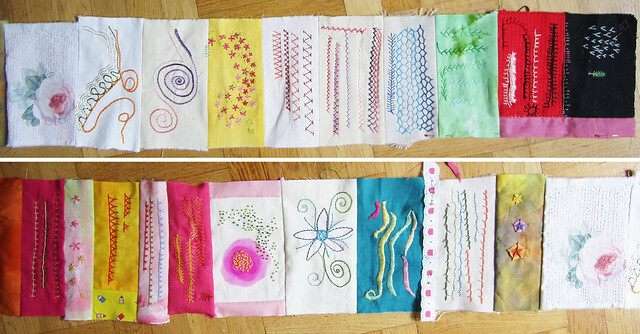 I quickly find a flow and hope to remember at least some of these to try in future embroidery work I do! Previous projects include ICAD (Index Card A Day Summer 2011) and DAC (Daily Art Cards 2008)! How do you challenge yourself – or others? This entry was posted in Crafts and tagged Big Projects, embroidery, free form embroidery, progress, sampler, stitch, TAST. Bookmark the permalink. Hi Hannah Love your creativity … I have followed you for many years now and you just keep on being so inspiring. Looks great! I think I want to do something similar in the future, after my ongoing project perhaps…. Love this project! It reminds me of when I was very young and my grandmother taught me to embroidery by stitching a sampler – made up of rows of different stitches. (I believe I still have that sampler somewhere). I am looking forward to seeing your finished project . . . and thank you for bringing back a very special memory for me. It is wonderful to see your beautiful work so far. Thanks for sharing your sampler. Hanna, Your ‘lessons learned’ notes are quite helpful. I can see where you would be tempted to try to perfect a stitch that you don’t adore, but it is really just enough to try it, and move on. Beautiful photographs of your finished stitch work.